The last written history of the Augusta, Georgia, Judicial Circuit was in 1890. Wade Padgett has expanded upon that history and examines the judicial history of the state of Georgia from its inception as a Royal Colony through the 2016 elections. 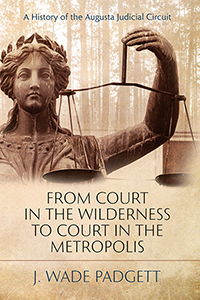 However, this work is not a dry recitation of judicial history in Georgia but is brought to life by focusing on the men and women who have served in various judicial positions within the Circuit. Special attention has been devoted to genealogical facts of each of the office-holders. Included is an architectural history of the courthouses of Richmond, Columbia, and Burke counties in Georgia. Filled with facts and stories unique to Augusta, the book is also rich in colonial history.